Tips: “Don’t drink and wax,” Some people come in after consuming alcohol thinking it’ll ease the pain, but alcohol tightens pores, making it much more painful.” Stimulants, like coffee, can also increase sensitivity. Also, do your research and find a salon that uses good quality wax. Better quality wax can mean a less painful experience. How It Works: Shaving removes hair at the skin’s surface by cutting it off with a razor. Best For: Legs, underarms, and those with lighter, finer hair. Pros: Inexpensive, painless, quick, and easy, and shaving creams used can help moisturize the skin, keeping it soft. Cons: Regrowth happens quickly, and since hair is cut off at the surface, regrown hair is blunt, not tapered, so it can appear thicker. Razor burn, nicks, and cuts are possibilities, and those who shave regularly can also become prone to ingrown hairs. How It Works: Laser penetrates the skin to target the hair shaft and inhibit hair growth. 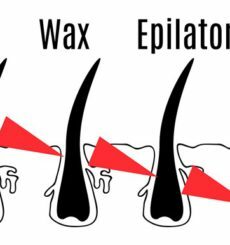 It essentially destroys the follicle, meaning it can achieve permanent removal. Typically, the hair in treated areas falls out within 2-3 weeks. Best For: People with hair darker than their skin. 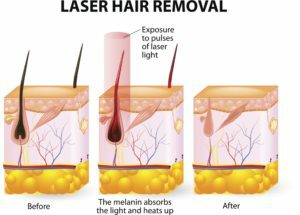 Laser targets the melanin in the hair, so it’s not suited for people with dark skin or pale hair. The laser needs to be able to lock on to the dark pigment in order to differentiate the dark hair from the skin. Pros: Great for long-term hair removal in all areas. “It causes no damage to the dermis, so even the most sensitive skin can be treated. Cons: Laser hair removal can be painful, with most people describing it as a “snapping” sensation against the skin, as well as a sensation of heat from the laser. Tips: While it may seem expensive, in the long run, many consider laser removal to be an investment that can pay off. “It is the most effective and cost-effective treatment, considering how much one can spend over a lifetime with options such as waxing or electrolysis.